Embeya, a progressive Asian restaurant in Chicago, has quickly become a favorite of mine for its great food and its total openness to making dishes that meet my low-salt, low-fat, low-sugar requirements. I enjoyed my first visit there so much that I suggested my wife and I dine there with friends. We went at the start of Chicago’s restaurant week, an annual event (running through Feb. 6 this year) during which restaurants offer special menus at special prices to lure Chicagoans out of their warm homes on the coldest winter days and nights. Embeya is offering either a three course meal for $33 or a four-course meal for $44. We went with the four-course offering and were not disappointed. And while everything was served family style, my portions were served separately since they had less salt, an extra touch I really appreciate. 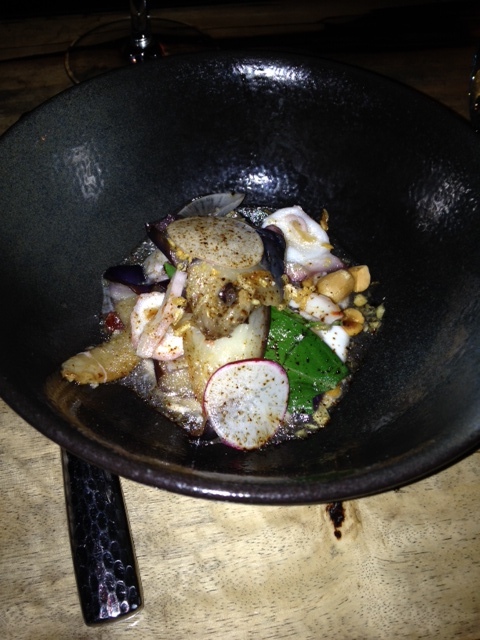 My individual serving of Embeya octopus was amazing. The first course included an amazing octopus dish that had people at our table who don’t normally eat octopus saying they loved it. 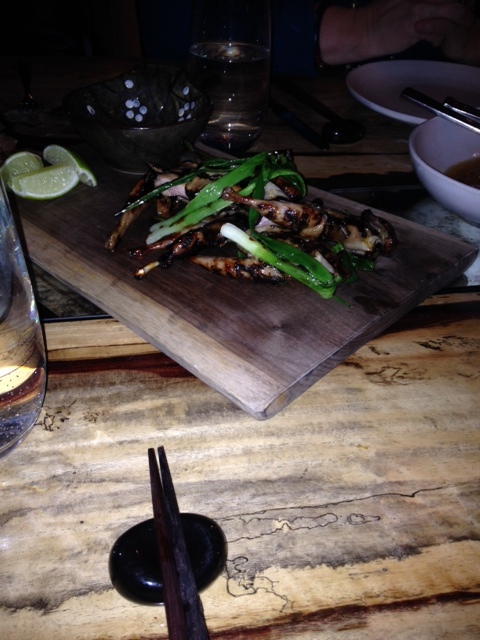 It was the tenderest octopus I’ve had since dining in southern Italy last summer. 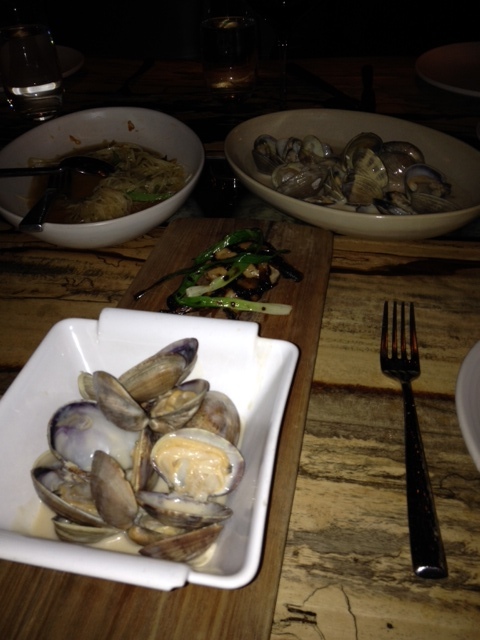 The second course included a nice rendition of clams in a coconut broth and also grilled quail which smelled so tasty I couldn’t wait to dig in. With those two done, the next round of dishes seemed almost anti-climatic. 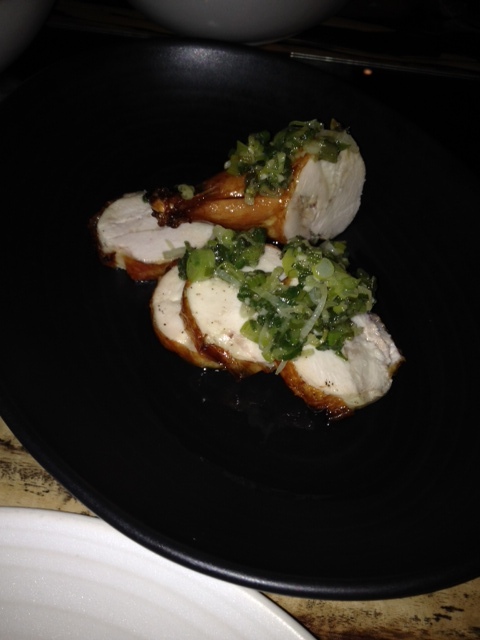 The garlic chicken was good but not as wonderful as the quail. And the braised pork was likely something I shouldn’t have eaten because of the fat involved. The Brussel sprouts, which I usually dislike, won me over to the odd looking veggie, at least for one night. For dessert, I requested some exotic fruit bowls, usually only a lunch option, and wowed friends with them. Dessert for the dinner included cream puffs and coconut ice cream which didn’t taste as coconut-ty as I was expecting. The quail smelled and tasted fantastic. The chicken was good, but the quail was my favorite. Everyone left feeling full and happy, what else can you ask for? If you see this before restaurant week ends, try to get to Embeya for this special menu. Go with the three-course offering, it is more filling than one might think and totally satisfying.